Dry mouth, a conditional also known as xerostomia, is reported to affect a third of the US adult population. There are two main causes for xerostomia. The first is aging. Saliva production naturally decreases as we grow older. The second most common cause is medication. More than 600 different types of medication site dry mouth as a common side effective. Medication for everything from allergy to blood pressure can lead to xerostomia. While not as popular as aging and medication, there are other possible causes of dry mouth including dehydration, chemotherapy, Sjögrens Syndrome, Parkinson’s Disease, diabetes and a variety of autoimmune diseases. If you suspect your dry mouth is the result of a medication you are taking, talk to your doctor about possible alternatives. If symptoms persist, speak with you doctor about other possible causes. You may need to be tested for autoimmune diseases that may be attacking your moisture-producing glands. About the Author: Dr. Anthony Dailley has been practicing dentistry since 1981 and specializes in curing bad breath solutions. He has a degree in Cell & Molecular Biology from San Francisco State University and a dental degree from the University of the Pacific School of Dentistry. Dr Dailley founded the Center for Breath Treatment, a specialty halitosis clinic located in the bay area. He also currently conducts research pertaining to halitosis products at the California Pacific Lab facility in Novato California. Dr. Dailley is also one of the founders and also on the board of directors of NovaBay Pharmaceuticals which is a publicly held biopharmaceutical company. Sinus irrigation is a highly effective treatment for sinusitis, allergies and chronic nasal congestion. During nasal irrigation, salt water or saline is pushed through the sinus and nasal cavities, flushing out mucous, pus, phlegm, bacteria and debris, all of which lead to sinus inflammation. Sinus irrigation also thins out natural secretions, reducing congestion. It washes away pollutants and allergens and reduces the bad-breath causing microbial biofilm that often coats the tonsils and pharynx. As a dentist and bad breath specialist, I frequently recommend the Hydro-Pulse™ Irrigation System to patients who have allergy or sinus issues, as these conditions often contribute to halitosis. This device is the best irrigation system I have come across in my professional career. It was designed by ear, nose and throat medical professionals and uses patented technology to painlessly pulse water through the sinuses. My patients often comment that the treatment vastly improves their quality of life, without an over-reliance on decongestants, cortesteroids, antihistamines and antibiotics. They are please to discover that sinus irrigation alleviates many unpleasant secondary symptoms, including headaches, bad breath, cough, nasal irritation and post nasal drip. Fill the reservoir tank with 16 ounces (1 pint) of clean, lukewarm water. Add one tsp. of Breath-Ease powdered saline and stir until fully dissolved. Attach the blue rubber nasal irrigation tip to the wand. Do not twist the tip. Position the nasal tip over your sink and flip the switch on the handle to "on". When ready, turn the switch on the base of the reservoir tank to “on” as well. Examine the water streams pressure and adjust it to the desired setting on the volume control dial. Once you have the desired pressure, turn the machine off and insert the rubber tips gently into your nostril. Lean over the sink at (or very close to) a 90 degree angle. Staying bent over like this will prevent the solution from running down your throat. Keep your mouth open during the entire irrigation process. Turn the machine on and allow the solution to push into your nasal cavity and drain through. Do not sniff or blow your nose while the solution is in your cavities. If you need to sneeze at any time, simply turn off the machine. Do not forcefully blow your nose when solution is flowing or during the irrigation process. If you must force out the solution, do so gently with both nostrils open. After you have completed approximately 8 ounces on one side, turn the machine off and switch nostrils. Repeat the process. 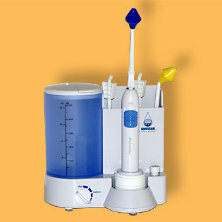 Once you are done, running 16 ounces of clean water through the device. This will wash out the salt and preserve the life of your device. You will likely experience some dripping after irrigation so keep a few tissues handy for about a half hour. About the Author: Dr. Anthony Dailley has been practicing dentistry since 1981 and specializes in curing bad breath. He has a degree in Cell & Molecular Biology from San Francisco State University and a dental degree from the University of the Pacific School of Dentistry. Dr Dailley founded the Center for Breath Treatment, a specialty halitosis clinic located in the bay area. He also currently conducts research pertaining to bad breath remedies and treatments at the California Pacific Lab facility in Novato California. Dr. Dailley is also one of the founders and also on the board of directors of NovaBay Pharmaceuticals which is a publicly held biopharmaceutical company.